SEOUL, Aug. 24 (Yonhap) -- The top U.S. envoy in South Korea voiced optimism on Friday about the role of Washington's new point man on Pyongyang, while he was guarded about Secretary of State Mike Pompeo's upcoming trip to the communist nation. In Washington D.C., Pompeo announced the appointment of Stephen Biegun, a Ford Motor Co. executive, as the department's special representative for North Korea policy. The secretary added that he and Biegun will travel to the North next week "to make further diplomatic progress" towards their objective, which is apparently denuclearization. He did not elaborate on the itinerary for what will be his fourth visit there as the top American diplomat. Speaking hours later here at a private forum in front of reporters, Amb. Harry Harris was cautious. "I am not going to speculate on the outcomes of the trip that was just announced to ensure that the secretary and his team have the opportunity to do the work they have to do without being subject to any speculation from the U.S. ambassador to Korea," he said. With regard to the new representative, Harris took note of his "impressive" record. "I do not know him in person, but he has an impressive record," the ambassador said. "I am optimistic that he will do the good work as the secretary is asking to do." Biegun served as vice president of international governmental affairs for Ford for more than a decade. He was earlier a senior staffer for former President George W. Bush's national security adviser Condoleezza Rice, and he also has foreign policy experience on Capitol Hill. 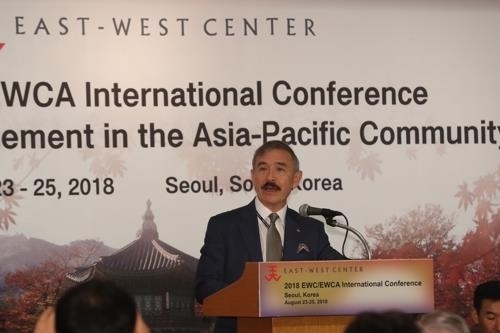 Speaking at a separate session of the conference hosted by the East-West Center, Deputy Assistant Secretary of State Walter Douglas would not comment either on Pompeo's plan to visit North Korea. Meanwhile, Harris spent more time addressing trade issues at the forum themed "Globalism vs. Regionalism." It was held as part of a three-day international alumni conference of the Hawaii-based institute underway in Seoul. On China's "One Belt, One Road" initiative, he stressed the importance of a "fair and sustainable" approach. "It's worthwhile to take a hard look at how the one belt one road is managed," he said.